I was on a short break and am back with an easy recipe for zucchini kootu. I learnt it from my mother-in- law. Using rice rinsed water, this simple and tasty side dish can be prepared in no time. I guess this is similar to the Eriseri which is prepared in Kerala, using plain water. Usually when I use an electric rice cooker I wash the rice and soak it for 30 minutes and then cook it, to get a soft texture. So whenever I use my electric rice cooker, I make this kootu with the rice soaked water, because I don’t want to use the regular pressure cooker also just to cook daal for sambar/kootu. My mother-in-law prepares this kootu with cucumber. I had only zucchini that day, so I tried it for the first time and it tasted so good. Did you know that zucchini can be eaten raw too? 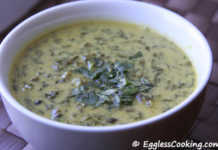 I especially like it in raitha/thayir pachadi which is nothing but a traditional Indian style yogurt dip. That along with brown rice bisi bele bath is a wonderful combination. Try it for yourself! 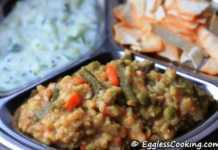 A very easy recipe to prepare zucchini kootu without using daal. Wash the rice like you always do, but instead of pouring it down the sink pour it in a sauce pan and add cubed zucchinis, tumeric powder and close the lid. When it is half cooked add the required amount of salt and let it cook for another couple of minutes. It should not become very mushy. Meanwhile grind all the ingredients together mentioned in the list and also do the tempering. Add the ground mixture and tempering to the zucchinis and let it boil for another 5 minutes. Garnish it with cilantro. This tasty kootu is good to be served with steaming hot white rice! Thanks madhu. I had no idea how cook zhucini well. This was a boon! You’re welcome Sowmya. 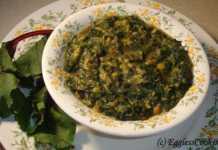 I also have another recipe for Zucchini Pappu and Zucchini Raitha along with brown rice bisi bela bath. Use the search button and you will be able to find it. You could Nandini. Chop it into small pieces because grating will be difficult. Tried it today Absolutely mouth-watering! Thanks for sharing a really easy-to-prepare recipe. Thanks for the feedback Paakapriya. I’m glad you like the daal. Welcome back madhu..Havent tried any recipe with zucchini..Nice one.. I don’t care for zucchini but my partner does and thanks to you I might impress him with this dish! Thank for sharing and keep up the great work! this is quite like erisherri. while making erisherri, we fry a tiny bit of coconut in coconut oil and add it at the end. 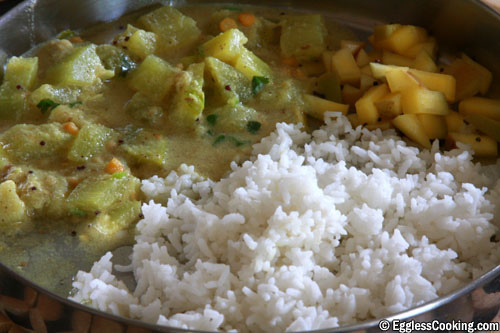 Swati, if zucchini is not available in India, you can try it with chow chow, cucumber also. Uma, Cham thank you. I have missed a couple of your posts too. Will catch up with it. Laksh, even I didn’t know it before. Bharti, no problem. Kootu is a south indian side dish prepared with a combination of vegetables and daal (either channa daal, toor daal or moong daal). It goes very well with rice and chapathis too. The standard masala is grinding coconut, cumin and red chillies together and adding it to the cooked vegetables and daal and doing the tadka. You can also check out the wikipedia link I have given for kootu. Pardon my ignorance, but what exactly is a kootu? Is it like a veggie stew, like a subzi? Nice and simple! Never knew we could make kootu without paruppu!